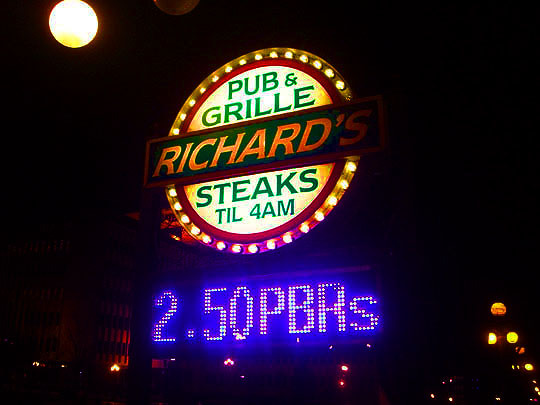 Live from Peoria, Illinois, it’s Saturday Night Cheeseburger starring this week’s host, Richard’s On Main and featuring the Ready For Prime Beef Player, Marty Wombacher. 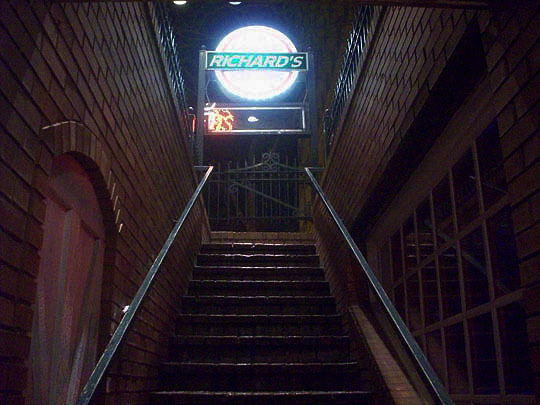 And now from down on Main Street, please welcome, Richard’s On Main! We made it! 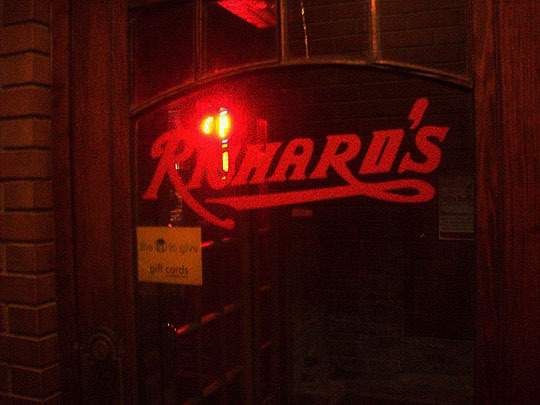 Here we are at Richard’s On Main, our SNC destination which we were at one year ago today! Down we descend into the underground bowels of downtown Peoria! Let’s get inside, I’m freezing my balls off out here. Ha! And Bingo was his name...oh! 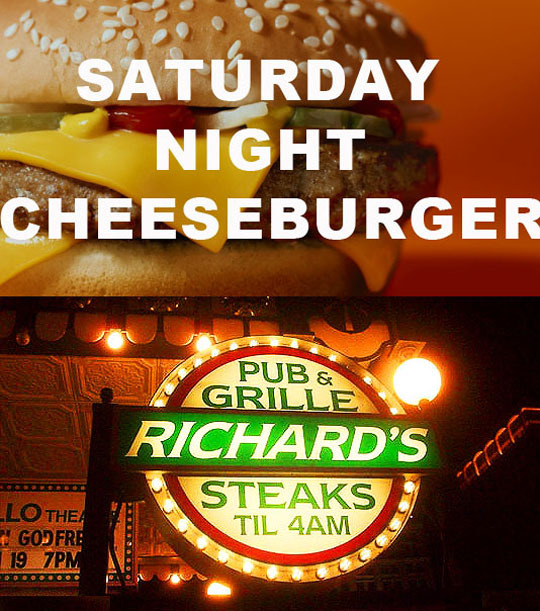 Let’s sit down and get settled in and let Saturday Night Cheeseburger begin! Pretty Jenna serves up the first Budweiser, we’re off to a great start! Here’s a shot of the front of the bar, love the stained glass up on the top! They have an impressive number of beers on tap. I love the tin ceiling in here! The dining room with tables and booths is just beyond the end of the bar. As you can see, they have a huge selection of beers in here, but as long as there’s Budweiser behind the bar, I’m happy! They have some great vintage photos of Peoria in here. This is the same building that The Thirty Thirty Coffee Company is in now. 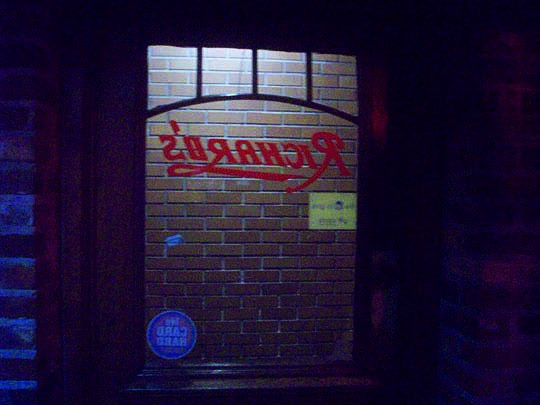 There’s a lot of history behind this painting on the wall in the back of the front of the bar, and you can read MBIP pal, Steve Tarter’s account of it right here in the PJ Star. The table is set and It looks like it’s just about time for Saturday night dinner! And baboom, here it is! On the suggestion from Roger the bartender, I got the Cajun Smothered Chicken. It looks and smells great! It’s delicious! You can read more about it in the review below. The twice-baked potato was an unexpected treat. It was topped with melted cheddar cheese and was oh so tasty! 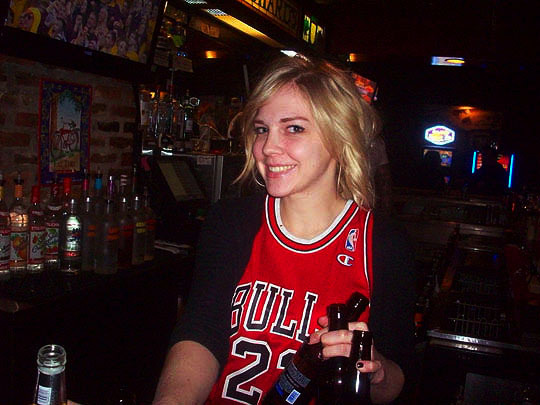 Here's Megan behind the bar looking super-cute and that's no bull! Curt has worked here for over four years, but tonight he was on the other side of the bar starting his birthday celebration! Happy birthday, Curt! 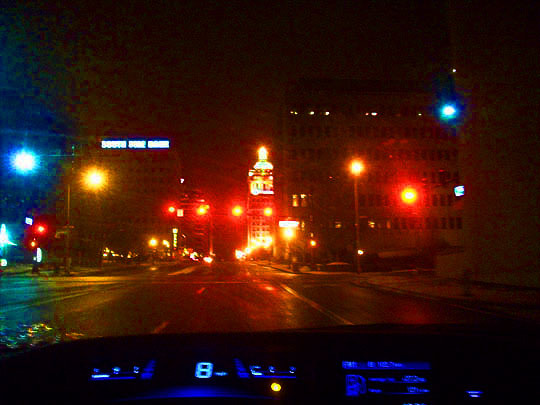 After one more beer for dessert, it's time to head on out the door. It's all uphill from here. We'll see you all tomorrow! 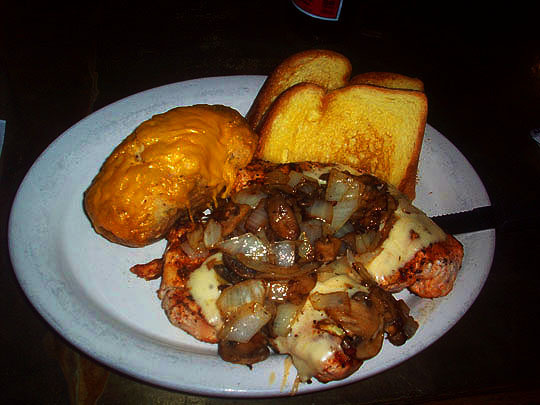 After a discussion at the bar, camera-shy bartender Roger suggested the Cajun Smothered Chicken Breasts and so that’s what I ordered. It was quite a winning suggestion! 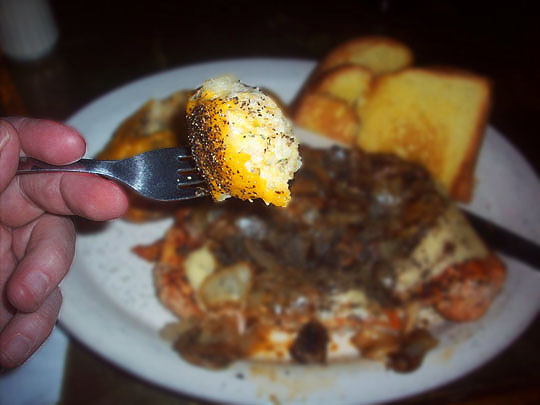 The dish consists of two juicy chicken breasts seasoned with their own blend of Cajun seasoning and grilled to perfection. As they’re almost done on the grill, they’re covered in spicy pepper jack cheese and then topped off with sauteed fresh mushrooms and savory grilled onions. The chicken is spicy, but not overwhelming, the emphasis is on taste, not heat. I also got a twice baked potato and it came topped with melted cheddar cheese and was the perfect accompaniment. Other dinner entrees include: a Ribeye dinner, Grilled Tuna Steaks, Pork Chops and a Coconut Shrimp Dinner. There’s also 16 types of sandwiches available, five styles of burgers, homemade pizza and nine varieties of salads available. And food is served till four in the morning for you hungry night owls out there. Three Galloping Gourmets, a delicious and unique tasting way of serving chicken and I highly recommend the twice-baked potato! Related Posts: SNC @ The Fish House, MBIP Headquarters and Jim’s Steakhouse. You make me jealous but I worship you. P.S. 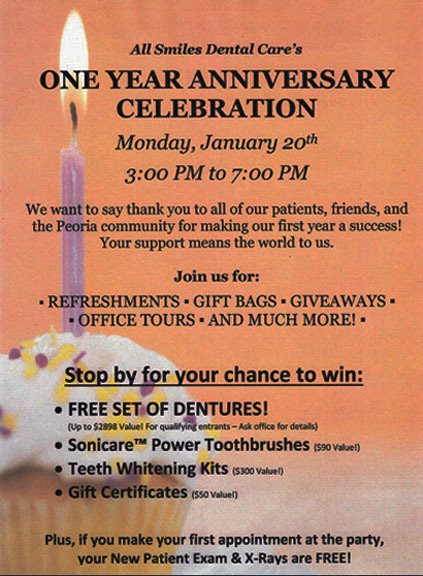 All Smiles Dental Care’s One Year Anniversary Celebration! All Smiles Dental Care, MBIP’s official dental care destination (see posts here and here), is having a one year anniversary party today! The details are below, stop by and say hello, this is the most fun dental office in the world! I hope to see you there!